In September, we have introduced a mini-collection of new models, purposed for the fall and winter days. Two of these are thanks to their practical dark palette ideal for the chilly weather, the third is in representative national colors. This fall, the models are a precursor that from 2015 on, you can look out for a new collection in the spring, and in the fall as well. New School is a piece with which we can freshen up the beginning of the new school year. The representative appearance in national colors is perfect for every occasion. Fresh, light, decent. They will be exceptional in front of the blackboard, as well as in all the various tests life prepares. Motto: For those who aren't old school. BOTAS 66 model New School is the successor of the popular Representant model, which has spent more than one season in the collection. The more curious readers haven't missed that this model was issued before in 2009 as a part of the very limited edition with the label of Hradčany (Prague Castle) under the name Botas for President. This edition was released during the official visit of the President of the Czech Republic in Skuteč. Doom Mood is inspired by the chilly fall mood, when the nights are getting longer and not every day is illuminated with the sunin the sky. On those days, it's better to stay at home. And on these days, Doom Mood comes in handy. The Dark shoes that can handle all of the pitfalls waiting behind the threshold, they can induce finding an excuse for going out for awalk. Motto: It doesn't have to be raining, just if it's dripping. 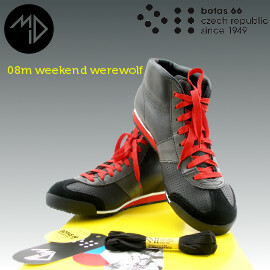 Weekend Werewolf is close to Doom Mood when it comes to materials. The dark grey and black combination is topped of with red, which underlines the unique shape of this high top shoe. Thanks to its design it's going even further in facing the unfavorable weather and fate in an attempt to hold you where the other sneakers will, with fear in their eyes, look forward to comming home. Motto: During the weekend, one goes a bit wild.